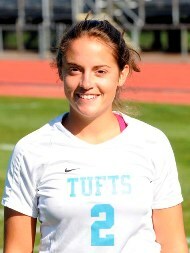 MIDDLETOWN, Conn. -- Senior co-captain Whitney Hardy (Truckee, CA) scored just 32 seconds into the game, and that would be the only tally of the day as the Tufts University women's soccer team earned its third shutout of the season in a 1-0 NESCAC victory at Wesleyan on Saturday. The Jumbos, who secured their first conference victory of the season, have now won two straight and three out of four overall. They improved to a 3-2 record including 1-2 in the league. Wesleyan, which had won three games in a row by a total score of 13-0, also now stands at 3-2 overall and 1-2 in NESCAC. Following a failed clearing attempt by Wesleyan, Hardy picked up the ball near the top of the box and fired a shot from the left side into an open net as Wesleyan sophomore keeper Clare Colton had not yet recovered from a previous situation. The goal provided Hardy's first points of the season. Tufts outshot Wesleyan 8-3 in the half but put just three of its eight shots on net. Jumbo senior goalkeeper Kate Minnehan (Hopkinton, NH) posted six saves for the shutout. She had four saves in the second half when the Cardinals out-shot Tufts 9-3 looking for the tying goal. Colton had three saves in goal for Wes. The hosts had statistical edges in shots at 12-11 and in corner kicks at 5-2. Tufts won its fourth straight game against the Cardinals and improved to 9-1-0 in its last ten games against Wesleyan. The last five games between the two schools have been shutouts, including a 3-0 Jumbo victory at Tufts in 2008. The Jumbos will travel to Babson for a non-conference match on Tuesday at 4:00. The Cardinals are next in action at Western Connecticut also on Tuesday at 7:00.